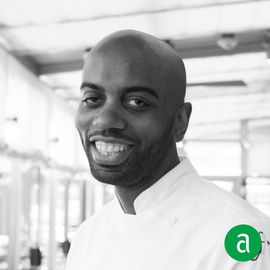 Anton Bolling, Executive Chef at Fiola Mare in Washington, DC, shares his career timeline and words of advice for up-and-coming professionals. While a senior in high school, I was studying engineering at Drexel University in Philly, aiming to become a physicist or an engineer. But I was craving to do something with my hands, something that would provide an instant reward. Cooking had always been a hobby at home, I helped cook holiday dinners with my family. One day, after coming home from a pretty demoralizing class, I watched a commercial on TV for Le Cordon Bleu. On a whim, I picked up the phone, and 30 minutes later, I was admitted into the program. Two months later, after graduating from high school, I started culinary school. The most important skill to possess is mastery of the basics. You must constantly build them to be better and master them. I would not be able to do my job without a speedy peeler. I always carry one in my pocket. Some advice I was given by my first chef out of culinary school as a young cook: focus on ingredients. Study them, learn about them. When you graduate from culinary school, you haven’t seen a lot. If you come across something you haven’t learned, ask questions, find out what is is, where it is from. We try to educate our team as much as possible. When we have time, we do cooking demos. We show how a plate is created starting from the end point and working backwards. How did the plate end up as such? We walk all the way back to where the produce came from. My first job out of school, at Starr’s Washington Square Restaurant (now Talula’s Garden) in Philly impacted me immensely. It was a small restaurant. Our crew consisted of seven women and men who worked together for two years. We challenged each other constantly. For example, we would run herb-chopping contests. It drove us to be better, and this drive came from the bottom up versus the top down. I love eating out and seeing what my peers are doing, chatting with fellow chefs, watching documentaries to keep educating myself. Social media has been a huge tool for inspiration. We also have a library full of cookbooks at the restaurant. Sometimes, I even go back to my old textbooks! When hiring, I look for people who are curious, willing to ask questions and have a tough skin. Candidates need to be eager to work -- be hungry. "What is your favorite restaurant in the city?" is a question I often ask candidates to understand whether they are truly interested and excited about what is happening and what other restaurants are doing locally and internationally.